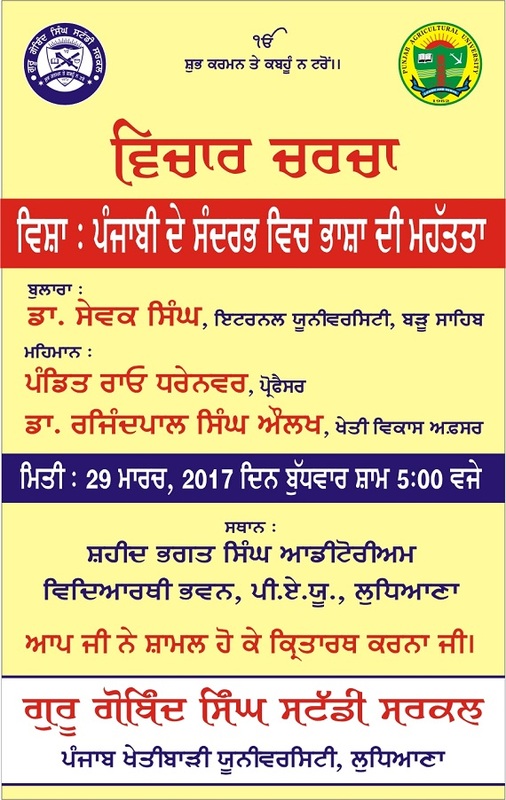 Ludhiana: Punjab Agriculture University, Ludhiana unit of the Guru Gobind Singh Study Circle (GGSSC) has announced to hold a lecture on Importance of Language (with Special Reference to Punjabi) at Shaheed Bhagat Singh Auditorium in PAU campus on Wednesday, March 29th 2017. The event shall commence at 5:00 PM. Dr Sewak Singh would be presiding as main speaker of the event and will deliver his lecture upon the subject. Pandit Rao Dharennavar, Professor at Panjab University and Dr Rajinderpal Singh Aulakh, Agriculture Development Officer would be the main guest of honour.